Omarosa: I Believe Trump Wants To Start A Race War - Joe.My.God. 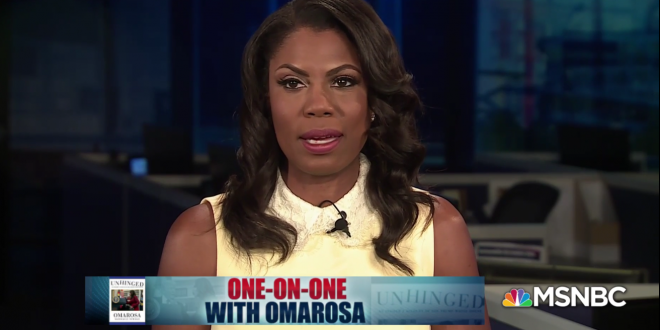 Former White House aide Omarosa Manigault Newman on Sunday said President Trump is “disingenuous” in his efforts to help the African-American community, and accused the president of wanting to start a race war. “We have a lot to lose right now,” Manigault Newman said on MSNBC’s “Politics Nation,” referencing Trump’s appeal to African-American voters during the 2016 campaign. “I believe he wants to start a race war in this country,” she added. “Every single time he had some type of issue with the community, I was there,” she said. “The one thing I realized once I was there was he was disingenuous to his commitment to diversity.” Manigault Newman said Trump is a “performer,” and that he’s more interested in using minority leaders as props than for in-depth conversations.